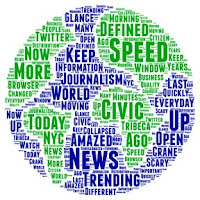 I am amazed more everyday by the speed of news - I keep a Twitter window open on my browser to glance at every now and then - TriBeCa was trending this morning (quickly moving up) - a crane had just (minutes ago) collapsed in NYC - scary . . . I am just amazed at how different the news distribution business has changed in the last 10 years. Not that you should watch it, nor that it should be important to you - but it is to many people there. Citizen and civic journalism has been defined - not by its quality, but its speed.